It’s called “the great wealth transfer”: $30 trillion in assets, 60 percent more than the nation’s annual gross domestic product, are expected to change hands as baby boomers pass on their wealth to their heirs. But where are these assets? The answer, it turns out, is that baby boomer assets permeate nearly every sector of the economy, including business ownership, home ownership, and commercial real estate ownership, such as manufactured housing (mobile home) parks, as Vermont Public Radio reports. 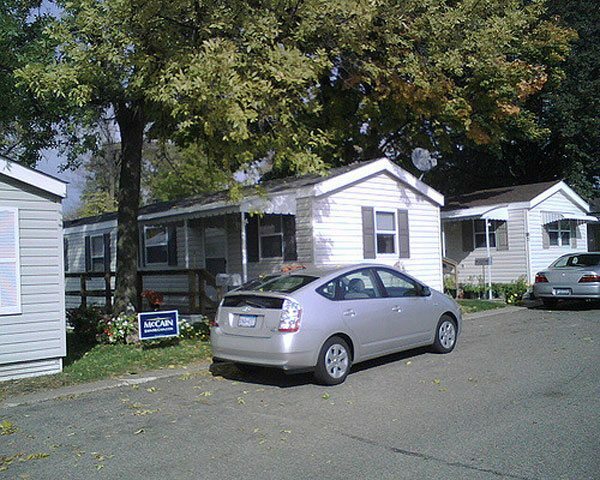 An estimated 17.5 million Americans live in manufactured housing, or about 9 million households. By contrast, only 1.1 million households in the United States are in public housing, and only about 4.5 million households receive any form of government housing subsidy at all. In other words, manufactured housing as a sector is twice as large as all federal housing assistance programs combined. Decades ago, cooperative land ownership was developed as an alternative. Through a resident-owned cooperative, manufactured home owners can pool capital to gain control of and title to the land under their homes. In Vermont, according to a 2016 state report, at present there are 11 cooperatively owned mobile home parks (out of a total of 241 sites). Nationally, the ROC (Resident-Owned Communities) USA network has supported the creation of 200 cooperatively owned mobile home parks in 14 states. One reason why the number of co-ops is modest is simple: A co-op can’t buy the land unless the owner is willing to sell. What is happening in Vermont, though, is that as mobile home park owners age, far more are starting to look for buyers, and owners are increasingly entertaining selling the mobile home parks to current residents. Bond says that as some mobile home park owners age and look to get out of the business of running a park, they are putting the land up for sale, and it is creating an opportunity for the residents to take over ownership. For park residents, when a park comes up for sale, it is their opportunity for potentially a generation to be able to purchase the park and have more control than they would ever have otherwise. An example of residents organizing to buy land is currently taking place at St. George Villa, a mobile home park about 20 minutes south of Burlington. With 120 mobile homes, it is one of the largest parks in the state. As Weiss-Tisman explains, residents found out about the fact that the park was going to be put up for sale “on the Friday before the July Fourth holiday weekend.” Backed by the Cooperative Development Institute, or CDI, a nonprofit that helps park residents work through the purchasing process, residents quickly organized and now hope to purchase the St. George Villa mobile home park and make it their own. Over the past six years, CDI has helped seven parks in Vermont become co-ops, and four more conversion efforts are in process. The conversion is still under review, so it’s too early to know for sure if the deal will go through. Lining up financing is usually not a major obstacle, but the cost of needed upgrades sometimes can be. One positive sign is that residents seem to be determined to make it work.